The 2017 Samsung Gear 360 has finally launched in the US for a remarkable $229! And there’s a promo to get it for even less. I also wanted to demonstrate the 2017 Gear 360’s image stabilization. The 2017 Samsung Gear 360 is the most affordable 4k 360 camera. It was launched about a month ago in Korea, Germany and a few other countries. It is finally launching in the US. Officially, the launch date is tomorrow, which is why it’s not yet on the Samsung US website (as of today May 25), but online retailers such as Amazon have already made the US version of the Gear 360 available. At just $229, it is the lowest cost 4K 360 camera (based on MSRP). Moreover, Samsung has a new promo that lets you buy the 2017 Gear 360 for just $49 if you get a Samsung S8 or S8+ within the promo period (May 25 to June 19). Although the Gear 360 is the lowest cost 4K camera, it is actually a pretty good 360 camera for both 360 photos and videos, and it is compatible with more devices than its predecessor. Here are my impressions. Lately, there has been a lot of buzz around stabilization – from gimbals such as the Guru 360, software such as Mettle Skybox, or more recently, gyro-based stabilization, as seen in the Insta360 Nano, Insta360 Air, Insta360 Pro, and Xiaomi Mi Sphere. The latest camera to breathe the rarefied atmosphere of The Stabilization Club is the Garmin Virb 360. Note: to get the stabilization, you have to turn on the “Tilt Correction” option in the app, and the “correct wobbles” checkbox in the Gear 360 Action Director 2 software. By default, they are off. You should also turn off this option when using a gimbal. – The Xiaomi Mijia Mi Sphere, with 3.5K video (around $255 to $320). See this stabilization demo. – The Insta360 Nano for iPhone, with 3K video (around $199). See this stabilization demo. – The Insta360 Air for Android with 3K or 2.5K video depending on your phone ($129 for Micro USB or USB Type C). See this stabilization demo. – Guru360 ($299). See this demo. – Feiyu G360 (around $350). See this demo. If you have a compatible Samsung phone (S6 or above), you can also consider getting the original Gear 360 which has been selling for under $200 lately. 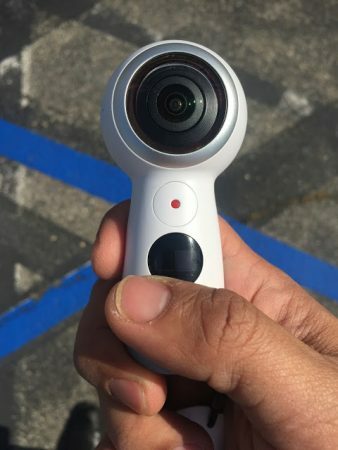 Here is a comparison between the 2017 and 2016 Gear 360 and a list of their differences. Do you know a way to stitch Gear 360 photos on Linux? I am trying to automate that part for a small app I am working on. I would look into Hugin. It is an open source stitching program you might be able to get to do what you need.